LeTourneau Baseball Takes Extra-Innings Win Over ASC Leading Howard Payne. LONGVIEW, Texas – Scrapping their way to extra-innings tied at 4-4, the LeTourneau University baseball team would use a leadoff double in the bottom of the 10th to set up a game-winning walk-off single to knock off American Southwest Conference-leading Howard Payne University by a final score of 5-4 in 10 innings at Conrad-Vernon Field in Longview on Thursday, April 11. With the win, LETU improves to 19-13 overall and 8-5 in conference while HPU slipped to 20-11 overall and 13-3 in the ASC. A shaky start to the game saw Howard Payne take advantage of a leadoff walk and error to put the first two batters of the game aboard before eventually scoring one run in the top of the first to go up 1-0. The HPU lead would eventually grow to 3-0 in the top of the third as two straight singles and a sacrifice fly pushed across one run, and an RBI single followed to put LeTourneau in a 3-0 hole. LETU would threaten to get a run back in the bottom of the third before stranding runners at second and third as HPU would get a pair of lineouts to end the inning. LeTourneau would break through in the fourth, however, scoring one run on a sacrifice fly after a leadoff single by Will Bradshaw and failed pickoff attempt put the junior in scoring position. Still trailing by a 3-1 margin, LETU would get back another run in the bottom of the sixth on a sacrifice fly as a one-out single and error would allow Jacob Jones to move to third and in position for Noah Mahoney to hit a sacrifice fly as LeTourneau kept slowly chipping away at the Howard Payne lead. Things would become tied 3-3 in the bottom of the seventh as Jacob Faubion would reach by error before eventually coming around to score on a Bryce Brueggemeyer single just out of reach from the shortstop. Howard Payne managed to reclaim the lead in the top of the eighth by taking advantage of two walks and a two-out single before seeing the top half of the frame end on a strikeout. LeTourneau would have a chance to tie things once again in the bottom of the eighth, but a pair of two-out singles would not be enough to plate a run as HPU held onto their one-run lead. Following a one-two-three top of the ninth, LETU would use two errors and a one-out single to put runners at second and third with one out while looking to end things in walk-off style. An RBI groundout from Bradshaw would tie things at 4-4, but LeTourneau would be unable to find a game-winner as the game would go to extra innings tied at 4-4. In the extra frame, Howard Payne would be retired in order as all three batters wound up as strikeout victims before Mahoney would lead off the bottom of the 10th with a double to right center field. Following a pop out in foul territory towards the first-base dugout, LeTourneau would choose to pinch-run for Mahoney with Colton Oney getting in the game as Kyle Guevara would come through in the clutch with a base-hit to center field to score Oney and send LETU home 5-4 winners. A strong pitching performance would come from LETU starter Kolton Eberlan who would go seven innings and take a no-decision after allowing three runs on five hits and striking out six before turning things over to Ryder Lognion. Lognion would toss the final three innings and strike out five to improve to 3-0 on the year as LETU pitchers held HPU to just six hits in the game. Brueggemeyer and Guevara would be the only two players in the game with multiple hits (two each) while Mahoney had the single extra-base hit of the game. 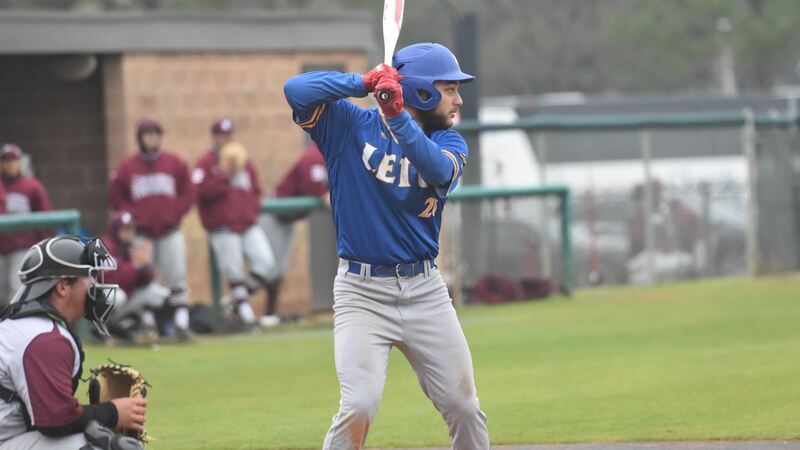 There were opportunities despite just the one-run victory for LeTourneau as LETU would strand ten runners in the game compared to five stranded runners for HPU. LeTourneau and Howard Payne face off twice more to close out an early weekend as the three-game series was pushed up 24 hours due to forecasted rain in the Longview area this weekend. Tomorrow will feature a 1:00 p.m. doubleheader to the series as LETU is going for their first ASC series win since March 8-9. 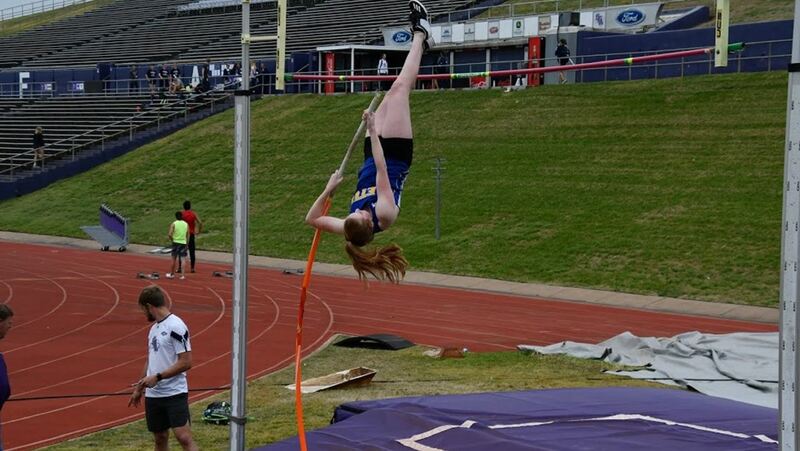 LeTourneau Track Led By Pole Vault On Day One Of East Texas Invitational. COMMERCE, Texas – Combining for five top-six finishes in the pole vault, the LeTourneau University men’s and women’s track and field teams would put up big marks on day one of the East Texas Invitational hosted by Texas A&M-Commerce on Thursday, April 11. Headlining the day for the LETU men would be Alex Hindman, Austin Parrish, and Collin Jones as all three would tie for first in the pole vault by clearing 4.70 meters (15 ft. – 5 in.) while Jack Miller (4.55 meters, 14 ft. – 11 in. ), Cole Ironside (4.25 meters, 13 ft. 11.25 in.) and Arvin Hrushka(3.95 meters, 12 ft. – 11.5 in.) also landed top-12 finishes in the event. Another critical contest for the YellowJacket men on Thursday would be the long jump as Stanley Williams would record a personal-best 7.01 meters (23 ft. – 0 in.) to finish third while Keishaun McMillian took fifth (6.96 meters, 22 ft. – 10 in.). Javaughn Dantzler (6.50 meters, 21 ft. – 0 in) would also compete in the long jump for LeTourneau while Adrik Kling(34.58 meters, 113 ft. – 5 in.) and Judson Iverson (32.84 meters, 107 ft. – 9 in.) competed in the hammer throw and landed top-10 finishes. The final event of the day for the LETU men would be the discus as Hrushka would set a school record with a throw of 38.10 meters (125 ft. – 0 in.) while Adrik Kling recorded a mark of 31.12 meters (102 ft. – 1 in.). One school-record would also be seen by Rebekah Stevenson for the LeTourneau women in the hammer throw with a toss of 38.68 meters (126 ft. – 11 in.) before the junior would go on to compete in the discus (29.22 meters, 95 ft. – 10 in.). The YellowJackets would also see Alicia Griscom compete in the hammer throw with a mark of 33.20 meters (108 ft. – 11 in.) while Kaylee Packer took fourth in the pole vault (3.10 meters, 10 ft. – 2 in.). Other student-athletes competing for LETU on Thursday would be Georgianna Roeder (5.11 meters, 16 ft. – 9.25 in.) and Hayley Anguiano (4.07 meters, 13 ft. – 4.25 in.) in the long jump. Day two of the East Texas Invitational is slated to get underway at noon in Commerce, with both track and field events scheduled to take place throughout the day. LETU will have numerous student-athletes scheduled to compete throughout the day in their final tune-up before the American Southwest Conference Championships. Late-Innings Magic Gives LeTourneau Softball 2-1 Home Win Over Texas-Dallas. LONGVIEW, Texas – Finding themselves in a pitcher’s duel to open up a critical three-game American Southwest Conference series, the LeTourneau University softball team would score one run in the bottom of the sixth and score the game-winning run in walk-off style. That came in the bottom of the seventh for a 2-1 home win over Texas-Dallas at the LETU Softball Field on Thursday, April 11. LETU is now 18-13 overall and 15-10 in ASC action while the Comets fall to 14-14 overall and 10-11 in the ASC. Pitching set the tone for both the YellowJackets and UTD early in the game as just two hits would be had in the opening three innings of play with the Comets hitting a two-out solo home run in the top of the second to grab the lead. LETU would threaten in the bottom of the fourth with a pair of one-out hits to put two runners on but would be unable to push across any runs as Texas-Dallas would remain on top 1-0. UTD would look to add to their lead in the top of the fifth with a one-out double and base runner reaching by error, but it would be LeTourneau who would flip the script on the Comets to escape the jam unscathed and keep things at a one-run deficit. A leadoff home run by senior Macey Mize would get even the score at 1-1 in the bottom of the sixth as LETU would see the inning end on a double-play but gain new life with the scored tied. Things would appear as though Texas-Dallas would be poised to take the lead in the top of the seventh by loading the bases with one out. However, freshman Bailey Richey would strike out the final two batters of the inning to prevent any runs from scoring and give LETU a chance at a walk-off win in the bottom half of the inning. A Katelyn Trombley single to start off the bottom of the seventh and Richey sacrifice bunt would put the game-winning run at second base when LETU would call on pinch-hitter Tori Hudson to come through in a big moment. Hudson would put the ball in play to the right side of the infield and force a quick throw from the Comet second-baseman that would end up going past the first baseman as Trombley would manage to score from second and give LeTourneau the win. Richey earned herself a complete-game win in the circle, striking out four and allowing just one run on six hits. 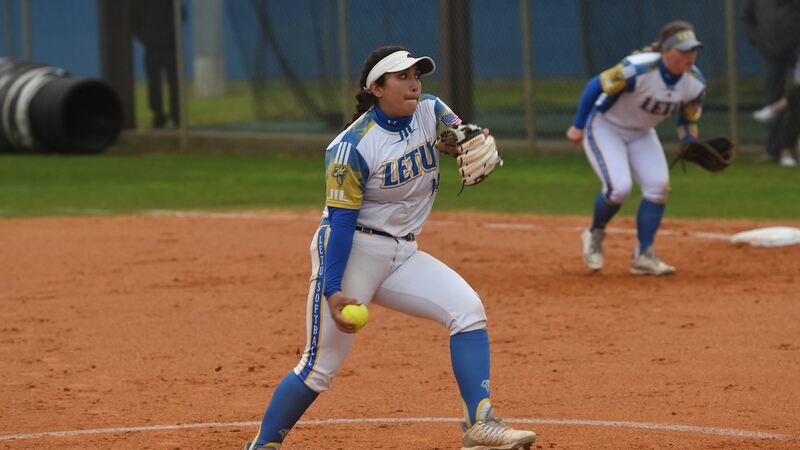 Despite being limited to only four hits in the contest, LETU would take advantage of three Texas-Dallas errors and two walks to earn the victory. A day of celebration is for LeTourneau on Friday, April 12 as the YellowJackets will host senior day and “For the Heroes” day before the first pitch of a 2:00 pm doubleheader with Texas-Dallas. LETU will honor lone senior Macey Mize while also taking time to honor fallen military service members and their families while wearing special uniforms. Each LeTourneau softball player has chosen a fallen service member to play for an honor tomorrow. The family is providing their uniform after the game.